EVERY now and again, a book comes along that will be kept near to hand and will end up very dog-eared by constant use. Such a book is Ian McDonald’s A Cloud of Witnesses published by The Caribbean Press, which Ronald Sanders reviews in this article for Jamaica’s Observer. It is a collection of thoughtful reflections on the Caribbean condition; visionary and inspirational addresses to diplomats and graduating university students; and moving accounts of experiences that are shaping today’s Caribbean. The topics in the book are varied, reflecting a long life in the Caribbean; the interests of a man who is poet and writer; a lover of cricket; executive in the sugar industry and a consummate West Indian, born in Trinidad of Antigua and St Kitts ancestry, grew up in Trinidad and Antigua, earned a degree from Cambridge University, captained the West Indies Davis Cup tennis team, and worked most of his adult life in Guyana. He is also among a rare breed — a white and proud West Indian as comfortable in the company of other West Indians of all races as he is content in his own skin. But McDonald is worldly and wise enough to wonder “how many black persons living in predominantly white communities” can take for granted the “blessing” that was his own experience in the West Indies. In this racial inter-mixing and acceptance, the Caribbean remains special, and an example to the world. After he retired as an executive of the sugar industry in Guyana, and by then an accomplished and well-recognised writer and poet, McDonald worked with the West Indian Commission — that body of distinguished West Indian men and women who produced in 1992 the seminal study, Time for Action, that laid out a blueprint for the Caribbean’s future. McDonald recalls the testimony of “experts” who pointed to the models that were being developed elsewhere — the Asian Tigers, the Singapore model, the new Europe. He also remembers with satisfaction that the Commission felt that, while these models were useful reference points, the West Indian model had its own intrinsic value. “West Indians,” the report said, “offer a rare creation — a people of many nationalities, many races, many faiths, and different cultural heritages” who have stayed together in a single community. His profound belief does not prevent him from being “disillusioned with the pettifogging gradualism that the word Caricom is rapidly coming to stand for”. As for the grand communiqués, speeches and often touted plans of Caricom meetings, he despairs — “every country in the region is littered with the burnt-out corpses of plans not implemented and reports unread”. Of the high-sounding declarations, he laments that they are “declarations of futility”. Let me not convey the impression that McDonald’s book is only about the nobility and importance of West Indian-ness and the necessity to consolidate its value; it is much more. It is rich in description of the things that mean much to us as individuals, such as the ageing and death of our parents — “the signs of their ageing threatened my contentment… Intellectually I knew they were not immortal but now I saw that it was true”. The book conjoins cricket with poetry not only in capturing the superlative stroke play of Rohan Kanhai and Vivian Richards; the genius of Frank Worrell; and the artistry of Garfield Sobers and Brian Lara, but the essence of what cricket means to every West Indian — “truly, cricket is supremely an imaginative possession which binds our Caribbean Community together… If it is no longer to be so, we have lost something of infinite value”. When Pakistan became independent, he was seconded to become the commander-in-chief of the Pakistan Air Force. He was Sir Arthur McDonald, Ian’s uncle who was born and grew up in Antigua. The book is also about poetry, poets and poems used to illuminate the best and worst in human aspiration and disappointment. But mostly descriptions of the things that give pleasure and cause the soul to soar and want to accomplish what looks impossible, like “painting the wind” or creating a West Indian nation. 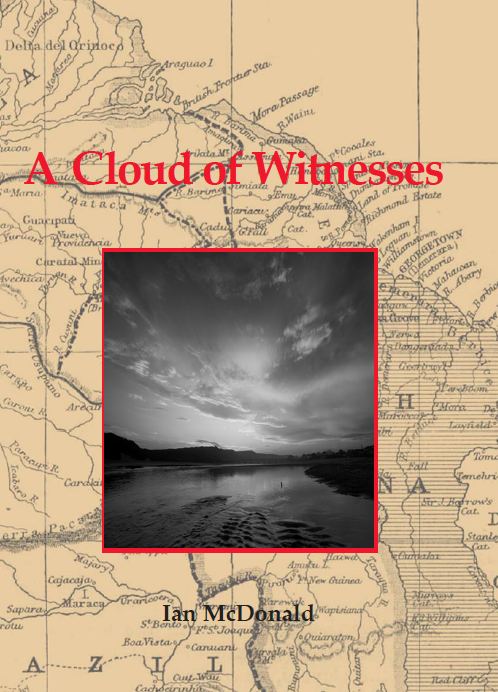 Ian McDonald’s Cloud of Witnesses is a literary treasure. I am a subscriber to Repeating Islands and read the postings with pleasure. I was delighted to read today Sir Ronald Sander’s article on Ian McDonald’s A Cloud of Witnesses. I read A Cloud of Witnesses with breathless joy in the first week of May (while on a visit to Cambridge, Massachusetts) and followed it up writing an essay–“The Enormous Privilege of Reading Ian McDonald” (6 pages)– on McDonald’s luminous book. I would be happy to share this essay with you. How do I do it? Shall be glad hear from you.